With the Christmas decorations packed away and leftovers foiled in the fridge, the last thing you probably want to do right now is clean. However, while the phrase ‘new year, new start,’ is a complete cliché, January still makes the perfect time to set yourself on the right foot for the next few months, especially with your kitchen cleaning. It’s going to be seeing a LOT over the festive period, so making sure you’ve got a clean and functional space in the first few weeks of 2019 is a must. You probably already have a ton you need to sort out, and a smelly or cluttered kitchen shouldn’t be pulling you down on top of that. So sit back, relax and take a look at our top tips for sorting your kitchen out for this new year! Everyone at some point has encountered that nasty fridge smell, so it’s always good to give it a deep cleanse as part of your overall kitchen cleaning routine. Start by going through your fridge and seeing how many of those festive leftovers will keep… and also if you really want to keep them. Things like gravy and bread sauce aren’t going to keep for more than a couple of days in the fridge. While you might have spent a while making them, be honest with yourself about whether you’re going to actually use them. Meats like turkey, ham and duck are really only good for 3-4 days in the fridge once cooked, so if you still have some now, you should throw them out. Luckily, if you want to keep them longer, they’re good for 2-3 months in the freezer. The same guidelines apply for vegetables too. Once all your food is sorted, it’s good to give the actual fridge itself a deep clean. If it’s seriously grimy, then make sure to unplug it to avoid wasting electricity. Wash the shelves and drawers with warm soapy water to get rid of any food residue and then wipe down the inside with a multi-purpose cleaner. If there’s still a persistent smell, place an open box of baking soda in the door overnight. This should absorb any nasty smells and leave your fridge fresh and clean. It’s safe to say that your cookware probably saw A LOT of action of Christmas, so it’s a good idea to give them a proper dose of kitchen cleaning now. If you’ve got any burnt-on stains on your stainless products, you can remove them by boiling water them with a spoonful of baking soda. After twenty minutes, the majority of the stain should have bubbled off. Once that’s done, and if there’s still a little left, drain the water and scrub the bottom of the pot or pan with a scour and a little more baking soda. For really tough stains, add a little vinegar to your pot before you add the water, but only try that if the stain isn’t lifted after two rounds without. Your wooden cooking aids are going to need some love too. For wooden spoons, cutting boards or wooden handled knives, wash them by hand with some mild soap and then apply a mineral oil to give them back a natural shine. Leave overnight and then wipe away any excess to leave them looking good as new! When was the last time you actually took the time to have a proper sort out of your drawers? The last time you did some proper kitchen cleaning? Three months ago? Six months ago? When you first moved in? Going through your drawers might not sound like a fun task but it’ll save you headaches in the long run when looking for certain utensils. Plus, it’s always fun to discover a few items you never knew you owned or swore you’d lost while cleaning. Since they’re so close to the counter, drawers are liable to catch crumbs, so it’s always good to clean them thoroughly once and a while to avoid too much of a messy build-up. Before you put all those tools back in your drawer, make sure to think about whether you actually need them. 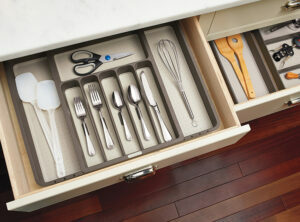 For the tools you only use once and a while, maybe move them from your most frequently used drawers. For the ones you never use, bin or charity shop. Don’t be a hoarder, you’ll just end up causing yourself more pain in the long run. 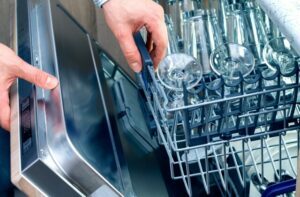 If you have a dishwasher, it’s probably saved you from handwashing a LOT of unsightly dishes over the years. However, constant use does mean it’ll need some TLC once and a while. While they may seem like inherently clean items, they can still collect food residue and have parts break down from lack of maintenance. First things first, you’ll need to completely empty the dishwasher and pull out the racks and anything else that can be removed. Wash all those pieces with warm soapy water and make sure there’s nothing stuck to them. Once that’s done, check the holes in the spinning arm for any debris (that’s where the water shoots out so we want it as clean as possible). To properly clean the filter, use a soft (unused) toothbrush with baking soda and warm water. For the rest of the dishwasher, give it a good wipe down especially around any sealed areas, like the door. Once that’s all done, run an empty cycle with a few tablespoons of vinegar in the bottom to get rid of any stains you may have missed or couldn’t scrub off with your bare hands. We’ve all seen something explode in the microwave. Whether it’s something boiling over or your dinner from last night getting a little too enthusiastic while heating up, your microwave can end up with a variety of different bits stuck all around the inside. And no one likes using the microwave when they know their food is going to come out tasting like the freshest stain in there. Luckily, cleaning your microwave isn’t have a taxing as the other items on this list. All you need is a jug, a lemon and a dishcloth. Fill up the measuring jug half way with water and squeeze a lemon’s worth of juice in there. Once you’ve done that, put the lemon half in the jug as well as a microwave on full power for three minutes. Once the timer goes off, leave the door closed for a further five minutes to keep any steam trapped inside. This is what loosens the tough stains. After five minutes have passed, carefully remove the jug and wipe the inside of the microwave with a dishcloth to remove the debris. If there are any stubborn spots, dip the corner of your cloth in the lemon water and scrub until it’s removed. Make sure you don’t forget the turntable and the door! While kitchen cleaning isn’t the most fun task, it is an important one and while you’re doing it you may be inspired to have a little redesign of your own! All of us at Roman Kitchens would like to wish you the very best for 2019! While you’re here, why not check out our designs page for a little inspiration?